This was the fourth and final novella I was to read for the November Novella Challenge. I can’t quite put my finger on why, but I must say I am not a huge fan of novellas. I finished this one last night right before midnight, so I finished the challenge, but I didn’t enjoy it like I thought I would. The good thing is all of the titles were in my TBR so I didn’t buy anything especially for this. 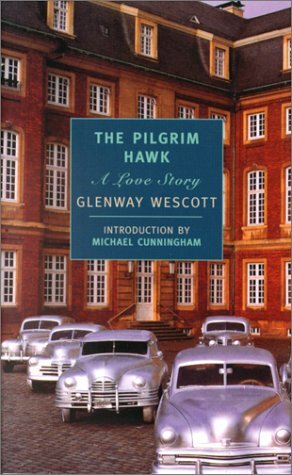 Despite being a very short 108 pages, I really struggled with The Pilgrim Hawk. There is nothing I can think of to write that is even remotely enlightening or interesting. So I will let the New York Review of Books (who published this edition) stand in for my review. It doesn’t mean I agree with their review, it just means I don’t care enough about the book to write my own. You might be interested to note on the NYRB link that Christopher Isherwood, an author I quite like, gave it a fulsome blurb. Out of the four I read for the challenge I liked Hemingway’s The Old Man and the Sea the best. Strachey’s Cheeful Weather for a Wedding and Fitzgerald’s Bookshop are tied for second place. Both were interesting and had their moments, but didn’t necessarily satisfy. The Pilgrim Hawk comes in a distant fourth. November Novella Challenge: 4 down, 0 to go. How can one not enjoy a book with a cover like that? The old book/cover thing may be true after all. Well at least you finished the challenge. The NYRB books are a very mixed bunch. While I have found that they all have high levels of literary quality, they're not all what I'd describe as a good read. I agree that the NYRB books are a mixed bunch. I've only read a few…some were lovely and other were real duds that I just couldn't get through. I'm glad you gave an honest opinion of this one. I certainly won't be picking it up now. Well, at least the cover of this one must have provided some enjoyment. Congratulations on finishing the challenge. Mary: That is the very reason I bought it. Plus it had an intro by Michael Cunningham. CB: Odd how literary quality and good reading don't always go together. LitStew: I am glad NYRB exist but they definitely do seem hit or miss. M Denise C: He is isn't he. JoAnn: Not only was the cover nice, but I got it for $2 at a charity shop. I only read one and then just couldnt do more. I will read some more at some point I just am not sure challenges work for me to be honest. Reading whims seem much more me, unless its book group but thats different. Simon: I have the same problem with challenges. I like making the list at the start, but then I get kind of annoyed by the constraints it puts on my choice of reading. Plus, who'd a thunk that novellas in general would feel like such a chore.